One thing The Institutional Church needs to remember is that most of the world doesn’t care what The Church – especially The Mainline Church – is doing. Level One: There’s a church in town and I’ve participated at least once. Level Two: I participate fairly regularly in that church. Level Three: I’m a leader in that church. Level Four: My leadership in church has expanded to connections with other believers outside my particular congregation. Level Five: Church people know me as a church leader. Level Six: I go to church conferences in my geographic area. Level Seven: I spend money and/or take vacation time to go to church conferences that require a plane ticket. Level Eight: I can identify the mid-council leaders of my denomination/somebody’s denomination. Level Nine: I know and care about denominational policies and can name at least three people who serve at the highest level of my denomination/somebody’s denomination. Level Ten: I can tell you who Paige Patterson is and what he said recently said that caused an uproar. I know what the United Methodist bishops just said about homosexual pastors and (for extra points) I know who the new Presbyterian Mission Agency Executive Director is. As a Level Ten Church Person (Paige Patterson. United Methodists. PMA Exec.) I read all manner of church information from news articles and policies to General Assembly overtures (look it up) and mission co-worker letters home. But I also know that most of the world Does Not Care about such things. In fact, the average church person is probably about a Level Two or Three. So how are we as the Church going to be Relevant, Engaged, Interesting, and Interested in these days? In many of our spiritual communities . . .
Information gets shared numerous ways (emails, newsletters, tweets, texts, snail mail) but it goes unread. Congregations hold meetings and there’s barely a quorum. Everything from a congregation leaving the denomination to a pastor being approved to serve in a new church is listed in a meeting’s Consent Motion/Omnibus Motion because it’s considered non-controversial/people want to get home ASAP. Sometimes people want cursory knowledge about church things, but are not invested/interested enough to study the situation. We might show up for a vote but not for informational sessions leading up to the vote. Whatever. 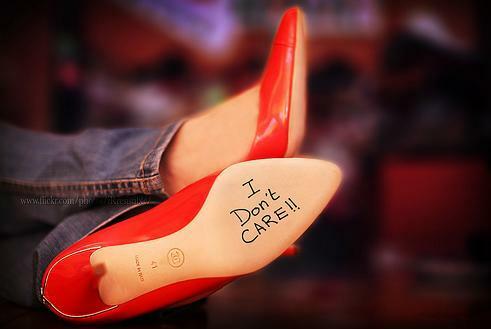 Don’t really care. I wonder about these things because on the one hand, some of these things truly don’t actually matter in the big scheme of things. But on the other hand, they matter a lot because People Matter. The Planet Matters. Structures Matter (although it’s not my favorite thing to debate.) Jesus even said that our Enemies Matter. When we can connect Church Stuff with People, there is a good possibility that others will take notice and maybe they’ll even care. The Church talks about the environment because we want people to be healthy. We create policies because we want people to be treated fairly. And the bottom line is that God created us (people) to love each other. If the Church isn’t ultimately about loving God and neighbor, I guess I don’t care either. But that is what a healthy church is all about. God. And the people.